"Two strangers fell in love. One knew it wasn't by chance." 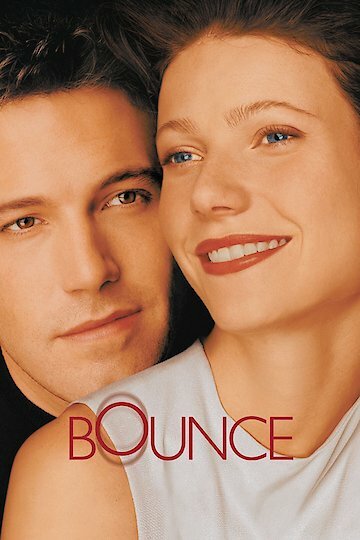 The movie Bounce starts out as a drama, but ends romantically. This movie begins with a single guy making a kind gesture by giving his boarding pass to a married guy who is trying to make it home to his family. Unfortunately, the plane crashed and the married guy does not make it home. Since the boarding pass was not switched according to airline policy, the identification of deceased passengers was all but simple. Ben Affleck’s character Buddy is the single guy who survives the crash, and he ends up feeling guilty because he survived and the married guy did not. Buddy makes a second attempt to correct the illegal boarding pass switch by doing what he can to make life easier for the surviving family of the married guy. During his kind gestures, he falls in love with Gwyneth Paltrow, whose character is the widow. The problem here is that he is not forthcoming about who he is and what his intentions are. Bounce is currently available to watch and stream, download, buy on demand at Hulu, Amazon, Vudu, Google Play, iTunes, YouTube VOD online.